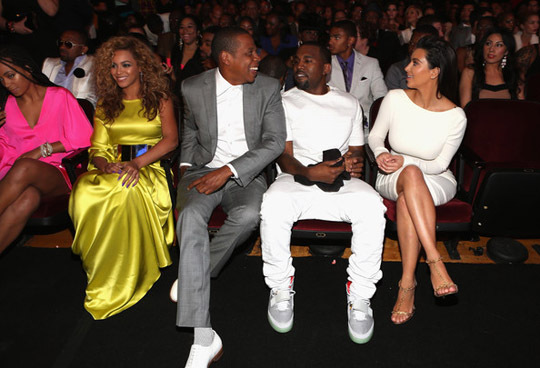 Perhaps one of the most discussed topics involved the appearances of Jay-Z, Beyonce & Kanye West who sat in front row all night and had a few special moments onstage. Kanye even brought his girlfriend Kim Kardashian with him. Beyonce brought her sister Solange (who celebrated a birthday recently). Beyonce stood out in a one shoulder yellow Stephane Rolland gown with a thigh-high slit and Givenchy Cone Heel Sandals. 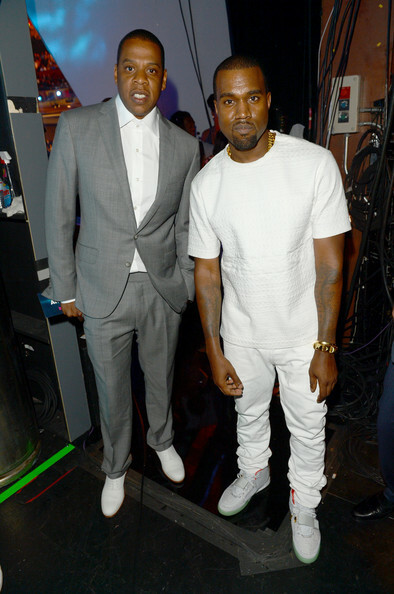 Jay-Z suited up in gray, while Kanye West, who opened the show, wore all white and his hot-selling Air Yeezy II sneakers. Kim Kardashian wore off-white to coordinate with Kanye. Her dress featured a zip detail and open back. Trey Songz didn't get the memo to dress up this year for the awards, but he mostly just came to enjoy the show this time around. 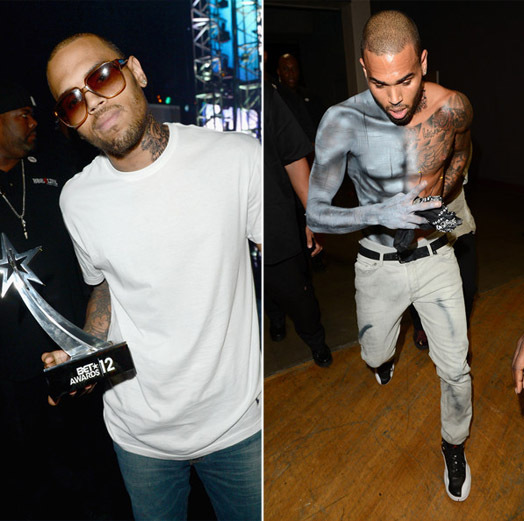 Chris Brown performed and won at the awards. Not too sure about the scruffy beard look. Usher also performed in a very basic look - his vocals were on point though. Nicki Minaj performed and won an award (Best Female Rapper - big surprise). She wore her usual form-fitting spandex. Singer Tamia wore a black Pleated Oscar De La Renta gown. Selita Ebanks wore an intricate beaded dress with sheer bottom half. Elle Varner wore an interesting abstract look. 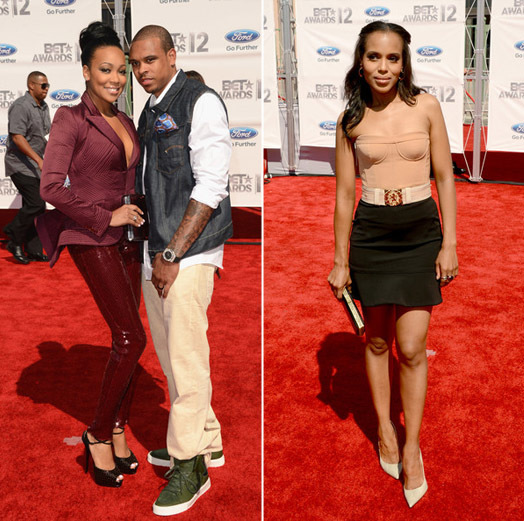 Monica (with husband Shannon Brown) wore a detailed blazer with sequin pants. Kerry Washington wore a bustier top with black skirt. Brandy, who (along with Monica, Chaka Khan and Cissy Houston) performed a great tribute for Whitney Houston, presented with Lauren London. Brandy wore s shirt-dress and Lauren wore a white jumpsuit. Lauren has just been added to the cast of The Game. 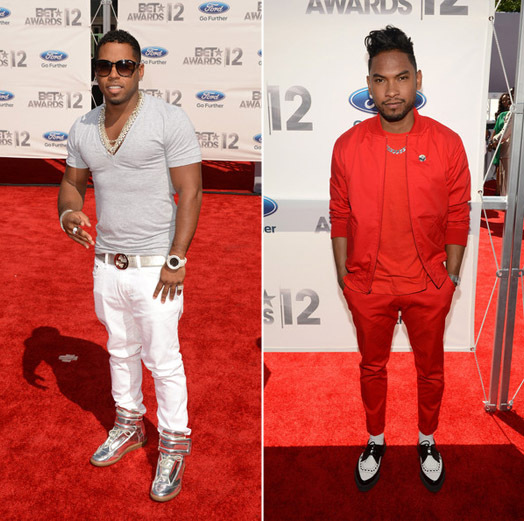 Bobby V wore a gray look and Miguel stood out (in a not so great way) in red. The young boys of Mindless Behavior coordinated in all-black. Willow Smith and brother Jaden Smith were their usual unique and eclectic selves. 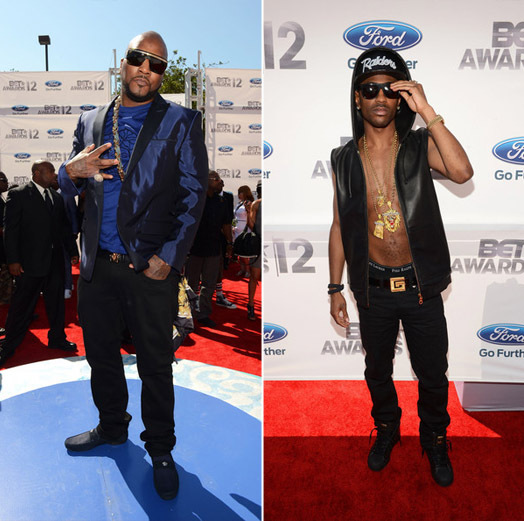 Jeezy was one of the few rappers who got a little serious - in a navy blue look. Big Sean, on the other hand, forgot his shirt. He was a winner on the show though. Lola Monroe wore a peach one sleeve gown. 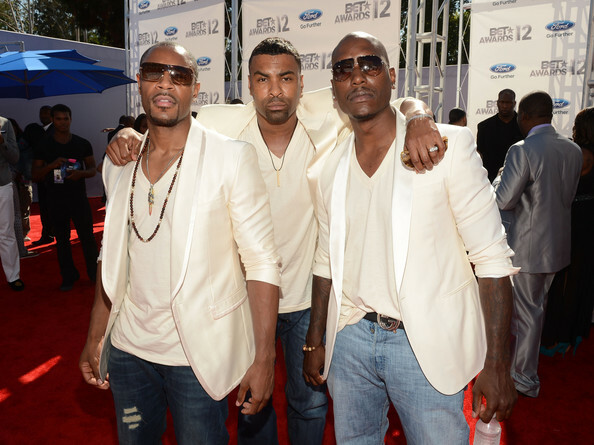 The guys of TGT (Tank, Ginuwine & Tyrese) wore matching off-white blazers. These are just some of the looks from the night. Overall, I (Whit W) would say the guys need to step it up. Who were your favorites? Beyonce looks beautiful! Wow! No Blue dress, lol! Wendy Raquel Robinson looks nice! Yellow looks nice on all of you! Jay- Z looks handsome! Never seen him attractive though! 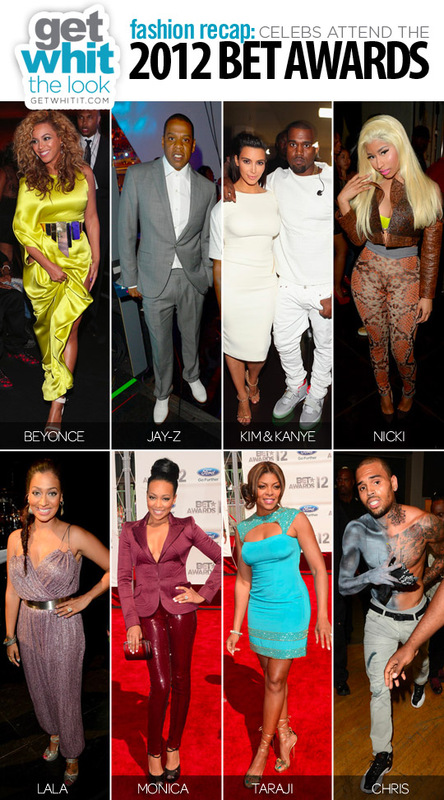 Kanye West, you look nice if that's your style for an award show, even though I NEVER find you attractive #formerfanhere! Kim Kardasian looks very pretty! 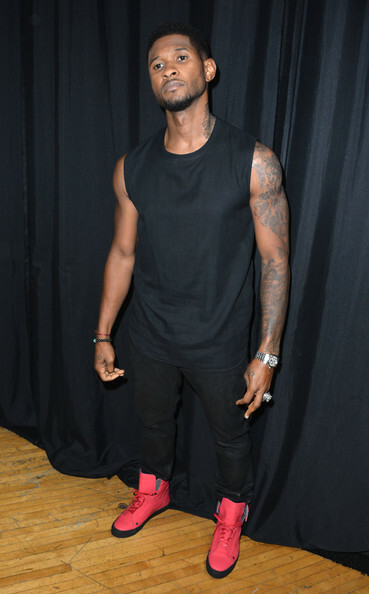 Trey Songz, My Love, you look cute! Can't wait for Chapter V next month, what I have heard so far is really good! Chris Brown, looks aight! Still haven't got fortune yet, hope he got some rnb on there you know he's gone to pop land, hope it's good though, you probably won cause people felt sorry for you after that altercation in New York! Usher, your face, you look sad :-(. Taraji P. Henson, you look very nice, one of my favorite actress out there, keep doing your thing! Tamia, looks nice, can't wait for that cd to drop. Been a fan of your since you came out! So, I'm guessing Grant was at home with the kids! 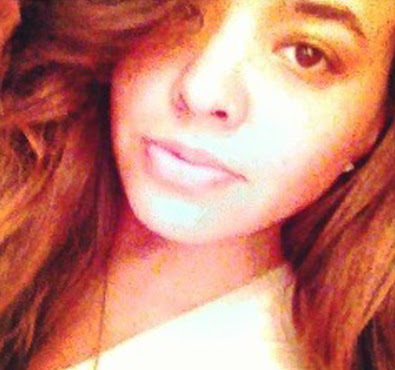 Monica, looks nice! Shannon looks nice! Cute Couple!!! Brandy looks nice, can't wait for your cd to come out as well! 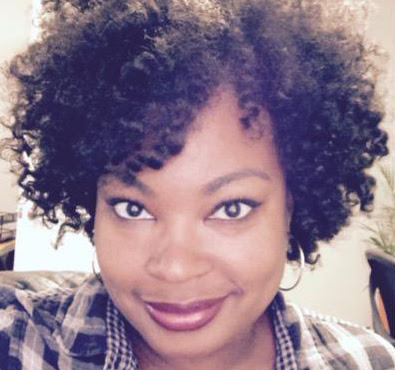 Meagan Goode looks nice, congratulations on your marriage! Miguel, you look retarded! #NeverWasAFanButDidLikeSomeOfYourMusicUntilYouWentCrazyTalkingAboutOtherArtistBetterStayOutOfYourLaneYouStillARookieSoShutYourTrapUpForAMin! Willow Smith, looks like herself as always! Big Sean looks aight too! 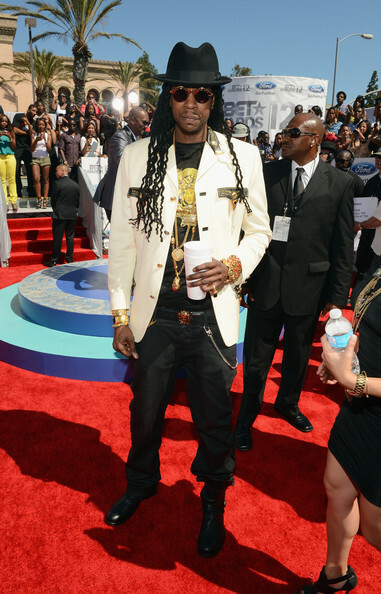 2 Chainz looks like Chuck Brown, lol! Lola looks like a mermaid, so beautiful! Last but not least TGT, Tank looks nice, Ginuwine haven't changed a bit, Tyrese, chocolate drop! Can't wait for the cd to drop, glad y'all group is still together!